I am back in the kitchen and I hope that everyone had a great Christmas filled with tasty food! The week in between Christmas and New Years can be a bit hectic and I wanted to try to simplify things by making some meals ahead of time. I like to have quiches for breakfast and one of the reasons is that there is generally a lot of leftovers and they reheat well for quick and easy breakfasts during the week. This recipe will make enough for a few breakfasts for one or two people and it can be doubled for larger families. Another thing that I like about quiches is the near limitless possibilities for different flavour combinations. This apple and cheddar quiche was inspired by the flavours in the apple and cheddar tart that I recently made and enjoyed! I started out by simmering chunks of apple in cider until they just turned tender and I did this because I knew that apple would not cook enough in the quiche to get tender and nobody wants to bite into a hard piece of apple when eating a quiche. Next I added a strong cheddar to finish off the primary flavours in the quiche. Since the rosemary went well in the tart I added some to the quiche as well and I figured that a bit of salty bacon would also be a hit. To keep things simple, I went with a pre-made frozen phyllo dough crust. I have to say that the apple and cheddar flavour combination with rosemary works very well in quiche form! I was particularly happy with the way that the phyllo dough crust worked out. Even though it was full of an egg mixture, the phyllo still got crispy and it allowed for a ‘deep dish’ style of quiche that was really nice. I served the apple and cheddar quiche along with an arugula salad with walnuts, feta and a simple lemon and oil vinaigrette. Simmer the apple slices in the cider until they just start to turn tender, about 3-5 minutes, remove and set them aside. Made your apple & cheese tart for a group of vegetarians on Christmas day! This looks like another good variation. Filo is definitely a store cupboard neccessity. I love quiche, and apples and cheddar are a natural. Tangy cheese, sweet apples, and eggy goodness can't be beat! This looks amazing. Is it just me or has your food photography gotten better? what a lovely quiche! it looks scrumptious! Me encanta la pasta filo, que delicia. That is one splendid quiche! A harmonious and awesome combination of flavors. Cheddar is meant to be paired with apple. thats one hefty quiche, just the way i love it. hope your holidays were good Kevin! I am here for the first time, i was curious… I never made a quiche with apples and cheese (pears and cheese yes, but apples…) Maybe because I don't use much cheddar… but yes, it should go well with apples. Give me a few days to think it over, in the meantime I'll follow you. Oh this looks fantastic! I have yet to make my own quiche but I'm definitely a fan. Oooh the phylo/filo/however you spell it dough looks like a great addition to a quiche! For more great culinary ideas and opportunities, check out my site, I think you'll like it. 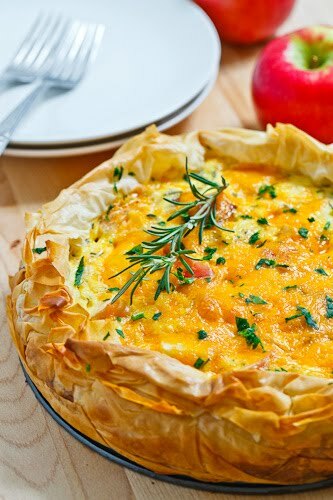 Filo always works very well on Quiches and is a wonderful time safer using the store bought one. I made your pear and Gorgonzola Quiche recently and it was sooo good. I am sure this is another winner. Thanks! Look at that color. It looks delicious. I love all kinds of quiches but I've never a) made a quiche with apples and b) made a quiche with phyllo. I have never tried apple with cheddar … looks like a really great combination!! What a lovely color for your Quiche! Looks delicious. I love the flavour combination. lovely colorful quiche. makes a gloomy winter day a comfortable one! 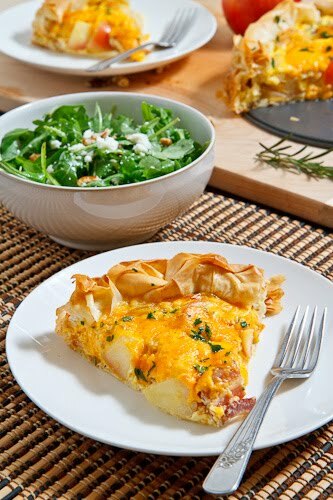 What a wonderful quiche and I love the simple salad as an accompaniment. Quiche is definitely the perfect thing to have sitting around the house right now because you can eat it any time! Love the apple and cheddar combo. Oooooh, this looks so tasty! And I have phyllo dough in my freezer to use up!! Excellent food photo. Delicious looking quiche. I'm a big fan of quiche and this sounds delectable. The combination of sweet and bitter is always my favorite. I also love anything that has cheese in it. Great Recipe! This sounds like a beautiful dish! I love the use of the phyllo dough for the crust! Love the use of apples and cheese. This is a combo that is definitely too underrated. Found me mac and cheese fame! Phyllo crusts are a delicious option and I can't wait to try this dish. Phyllo dough crust!? Brilliant! And it looks amazing! I LOVE the use of phyllo for the crust. Oftentimes I find quiches a little too rich because of the buttery crust. Phyllo is a great option because its rich, but the crispy layers make it much much lighter. I adore the phyllo crust! I'll definitely have to give that a shot. genius combo! and even more genius use of filo for a quiche pastry… it's strokes of masterfulness like these that make you the star you are Kevin! a good combination of taste and texture. i think i'll match this recipe with my own canning salsa recipes. Happy holidays! Great breakfast quiche! Never thought of using phyllo – and I always have too much when I buy it… Great idea. I was just sitting her brainstorming quiche ideas and thinking, wouldn't apple, bacon and cheddar be good? We do an apple, bacon, cheddar pizza with red onion mayo for the base, so it seemed like it might work. Yay for Google for bringing me here. 🙂 I'm going to try your recipe today. So I made this tonight but with 2 little changes; I added shallots and just sautéed both them and the apples in butter (rather than the cider you had used, since I didn't have any). Delicious, thank you! Ohhh myyy Godddd! Where has this blog been all my life!? First of all, HUGE fan! Love your stuff! We have a little cafe, so I make quiche almost every day. Have never used phyllo for the cost issue or apples! Curious as to what apple you would recommend? We use Granny Smith on our Turkeu Bacon Apple Panini and it works really well. Wondering if a sweeter apple would compliment the cheddar & egg better? Amanda Principato: I am glad that you have been enjoying my recipes! I like a sweet and tart apple for this, like a honey crisp, but granny smith would also be good!